This 108-card divination system, based on material from Lyssa Royal’s groundbreaking book Prism of Lyra, is designed to help you tap into your star lineage and karmic patterns. Also included is a 156-page softcover book that reveals lessons brought to Earth from the stars and describes how those lessons can be used in your life on Earth now. The Galactic Heritage Cards were first introduced in Japan, where hundreds of Lyssa’s students have since used them with profound results. 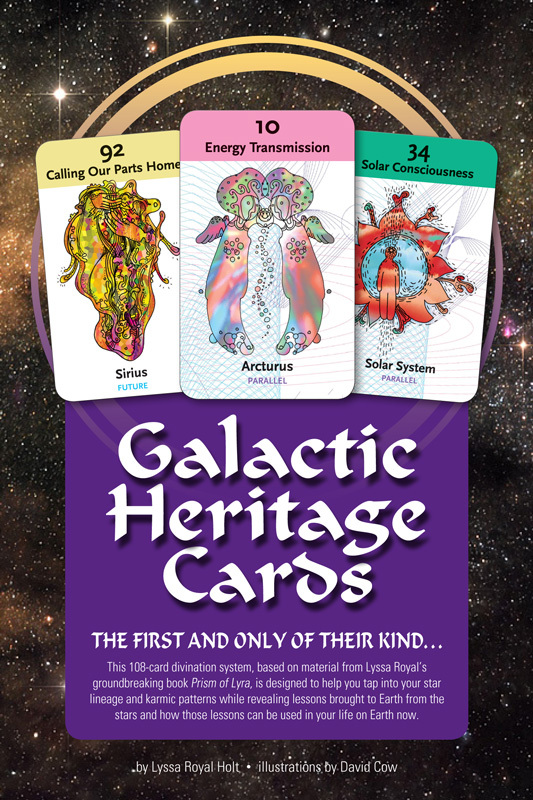 SPECIES or STAR SYSTEM: Twenty-one different species or star systems are represented in the cards to symbolize the main archetypal groups who have influenced the development of our galactic family. TIME STREAM or “SUIT”: Four “suits,” or time streams, are recognized — past, present, future, and parallel. These time streams are not meant to imply time periods in a rigid way but instead refer to the “era” of evolution from which the energy of each card is derived. THEME: Each card has a theme or lesson that is connected to the civilization it depicts. Contemplative text and deeper commentary are presented for each card to help users understand how to apply this wisdom in their current lives. ARTWORK: The architect of these cards, the multidimensional consciousness Germane channeled through Lyssa, also assisted Hong Kong artist David Cow in the channeling of the images. Contemplating the artwork allows more information and energy to be transmitted that goes beyond the text for each card. The art works deeply with the subconscious and adds a powerful dimension to the user’s inner work with the cards. In addition to the individual card art, an underlying image spans all the cards when they’re laid out on a grid with 18 cards per row. This image represents our journey back to integration, and thus each card carries an embedded energy of unity even within the uniqueness and “separate journey” of each card. When the final card was channeled, the total number was 108 — a sacred number in many traditions that reflects the idea of wholeness and completion. GETTING STARTED: In the accompanying booklet, we offer more information, the text and commentary for each card, and several recommended spreads to help you get started.